With modusCloud the ability to enabled archive for inbound and outbound emails is now possible. 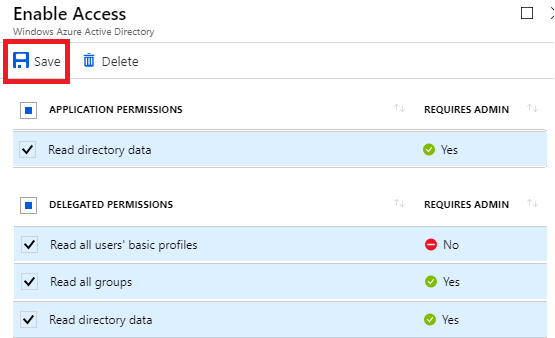 The process requires the archive feature be enabled followed by creating a connector on modusCloud, and then finalizing the setup with O365 send connector. The steps below allows one to follow step-by-step sequence. Note: It is recommended that the NDR undeliverable mailbox is not a shared mailbox. By default the feature is not enabled and must be activated for each client. 3- Enable "Enable Email Archive" and click Save. 4- This will activate a new tab in modusCloud ARCHIVE as shown below. A Connector is required so modusCloud is to associate to the tenant on O365 for each client. 1- In the Archive tab hover over the GEAR icon and click Connections. 2- Click the plus symbol + on the top right corner. 3- Enter a Description for the connector. 4- Select the connection type of IMAP. 5- Enter the Server Name to which modusCloud should connect to. 6- Enter the Username of the account that should be used to connect to the archive mailbox. 7- Enter the Password of the account that should be used to connect to the archive mailbox. 8- Enter the Port for the connection (Port 993 recommended) and click Save. 4- Select the connection type of SMTP (Office 365). 5- Enter a mailbox for the Undeliverable Journal Address. - This mailbox will need to match the undeliverable archive address you define when you create the send connector on Office 365. It is recommended you use a dedicated mailbox for the Undeliverable Archive address. 6- Click Next. A response is returned, providing you with a unique SMTP address. Copy or make note of this address as you will need to specify it when you configure Archiving on Office 365. 7- Click Done. so the details will look similar to as below. A dedicated outbound connector must be created so that all archive traffic is sent directly to the modusCloud Archive environment, instead of getting routed through the modusCloud gateway. 1- Sign-in to the Office 365 Administration Portal. 2- Click Admin (in the toolbar) and choose Exchange (in the left pane). 4- Click the Connectors tab. 5- Add an outbound connector by clicking the plus sign "+". 6- Select Office 365 from the From drop-down. 7- Select Partner organization from the To drop-down and click Next. 8- Enter a descriptive Name for the connector. 9- Then enable the connector by checking Turn it on. and click Next. 10- In the new screen that opens, select Only when email messages are sent to these domains. 11- Then click "+" sign and enter "*.earchive.cloud". 12- Click OK to return to the connectors screen and click Next. 13- Select Use the MX record associated with the partner's domain and Click Next. 14- Leave the default settings for TLS and click Next. 15- A summary of the configuration is displayed if all look correct click Next. 16- Enter an email address in order to validate the connector based on your region. 17- When prompted to validate the connection, click Validate. 18- Validation results are shown. To dismiss the results click Close. 3- In the Exchange Admin Center, click Compliance Management. 4- Click the Journal Rule tab. 5- In the customer admin address area, click Select Address, click Browse, and select an admin email account. - This account will receive notification of non-deliverable archive reports. 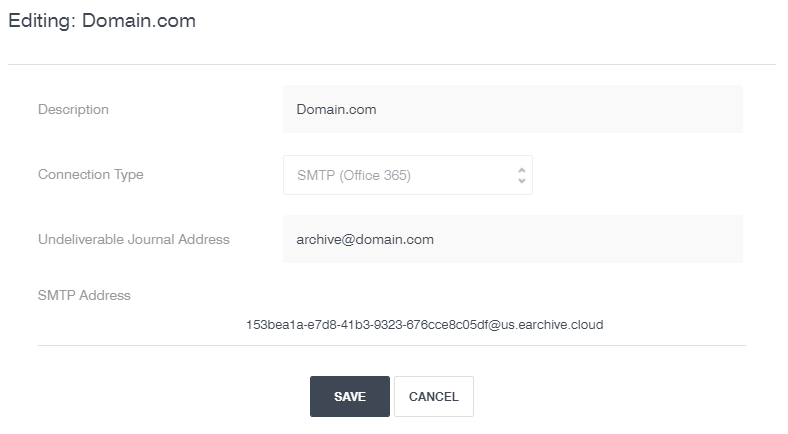 It is the same email address configured in modusCloud archive connection archive@domain.com. 6- Add a new journal rule by clicking the plus sign "+". 7- In the Send journal reports to field, enter the unique email address provided by modusCloud Archive as our example ie: 153bea1a-e7d8-xxxxxxxxxxxxxxxxxx@us.earchive.com. 8- Enter a descriptive Name for the rule. 9- From the If the message is sent to or received from... list, choose Apply to all messages. 10- From the Journal the following messages... list, choose All messages and click Save. 11- When prompted to confirm that you want the rule to apply to all messages click Yes. Note: It is recommended that a backup archive connection be made via IMAP. Click to the link to create a Backup Archive. A Connector is required so modusCloud is to associate to a local MS Exchange server for each client. 4- Select the connection type of SMTP (Local Exchange 2013+). 5- Enter the IP Addresses of the Senders Server public IP from which SMTP requests will be sent. 6- Click Next and a unique SMTP Address will be provided, Copy that address. 7- Click Save and Done. The archive account should not have any size restrictions applied to it. In addition, no Exchange Server rules should be applied to the account, especially rules that might move or delete messages from the account or move them to another folder such as Junk Mail. 1- While logged into the ECP web portal, click recipients in the left panel. 2- Click the mailboxes on the right panel. 3- Click the plus sign "+" and select User Mailbox. 4- In the popup window, click New User. 5- Enter the Alias, First Name and Last Name of this account. 6- Browse to select the Organization Unit in which you want to create the account. 7- Enter the User Logon Name. 8- Enter and verify a Password. 9- Browse to the Mailbox database in which you want to create the account and click Save. 10- Select the mailbox you just created and click the Edit icon. 11- On the Mailbox Feature tab (left panel), in the Message Delivery Restrictions section, click View Details. 12- For "Accept message from", select Only senders in the following list, click "+" and select the mailbox created earlier. 13- For "Reject messages from", ensure No Sender is selected. 14- Click OK, then Save. 15- Log into the new account using OWA to have Exchange initialize the mailbox. 1- While logged into the ECP Web Portal, click Compliance Management in the left panel. 2- Click Journal Rules in the right panel. 3- Click the plus sign "+" icon to create a new journal rule. 4- In the Send journal report to field, enter the email address of the journal mailbox (created in the previous step). 5- In the Name field, enter a descriptive name for the journaling rule. 6- Choose the appropriate option from the If the message is sent to or received from list. 7- Choose the appropriate option from the Journal the following messages list and click Save. 1- In the Exchange Admin Center, navigate to Mail Flow, and select Send Connector. 2- Add a send connector by click the plus sign "+". 3- Enter a descriptive Name for the connector. 4- For type, select Custom, then click Next. 5- Under Network Settings select MX record associated with recipient domain, then click Next. 6- Click the plus sign "+" to edit Address Space. 7- Set Type to SMTP. 8- For Full Qualified Domain Name (FQDN): enter "*.earchive.cloud". 9- Set Cost field to 1 and click Save, Then Next. 10- Click the plus sign "+" to edit Source Server. 11- Select the transport server(s) that will be associated with the connector. 12- Click Add, then OK, then Finish. ModusCloud is a closed relay system. This means that all mail going through the platform must have a user associated with the platform, whether that be End-User, Alias, or Functional Account. To resolve this issue you will want to check a few areas in modusCloud. 1- Check to see if the Domain has relay access turned on. Go to Company Settings > Domains, then make sure the switch is turned on to green. 2- Check the Users and Groups. Make sure the user who is receives the relay access denied error messages is listed in this section of the platform. If the account is a functional account, make sure the account is also listed under Functional Account tab. If you just added a new user in the last hour or enabled a relay on the Domains tab, your changes might have not taken effect. Give any enabled domain or added users 30 to 60 minutes to properly propagate on the platform. If you continue to receive this error message after trying these steps please contact Vircom support. Bulk is designed for users who need it for business critical purposes, e.g. Recruitment consultants emailing individuals applying for a specific job(s), support users needing to update their users and accounts departments sending invoices. The danger of giving all users bulk permissions is that this massively increases the risk to the company, the company’s clients and modusCloud of a spambot (for example) causing serious IP reputation problems. When a spambot is detected, modusCloud will shut down the infected address(es) to eliminate the risk of it causing any problems. Increasing the bulk limit for all users affectively removes this ability. There are specific third-party programs that are free to use and are designed for bulk sending, these would be recommended for services such as sending marketing material like newsletters. 1.6. 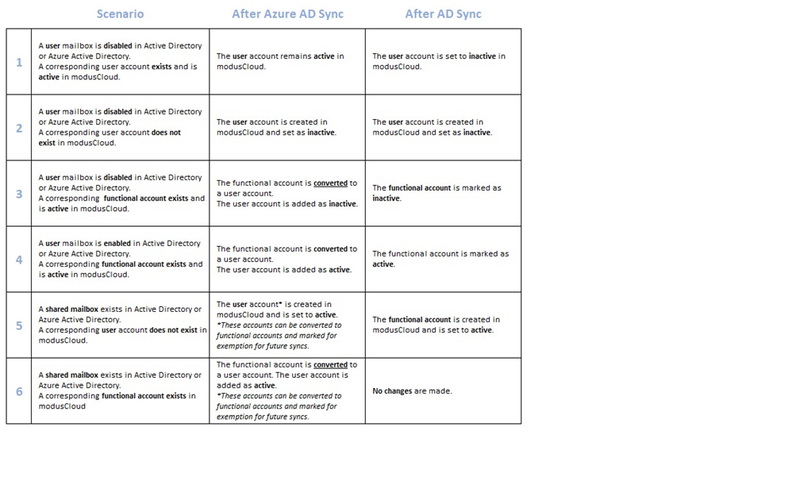 Difference between Azure and Active Directory Sync. The Emergency Inbox service was created for mail continuity as indicated on the linked page. Users that can access this feature are able to use a web mail based mail feature while their mail server is down. The modusCloud service will continue to try and check the customer's mail server, as per the standard set-up. As we are unable to relay the email from our system to the customer's server (as it is down), we are required by RFC to send a deferral notice back to the sending mail server that we have not been successful in delivering the email. As long as the customer's mail server is down, we will continue to send deferral messages for some time (we set 30 days) then bounce the message back to the sender. It is important that the customer mail server be brought back as soon as possible to not lose email. Emergency Inbox is used to provide users access to email in the event that their mail environment is unavailable. Once this occurs modusCloud will automatically begin to spool mail for the affected domain and the Emergency inbox will immediately begin to show the spooled mail. Users are able to send new messages as well as reply to received messages. When an email is sent out from Emergency Inbox – new email, reply to email – it is treated like any outbound message. So the email will show up in another internal user’s Emergency Inbox. Users are unable to see messages that were successfully delivered prior to mail delivery being impacted. 1- Log into the interface. By default, you are at the Account Setup page. 2- From here, you can go directly to the Emergency Inbox from the sub-heading under Account Setup. 1- As an admin, once you are logged in, go to the Users & Groups tab. 2- By default, you are in the Users sub-heading. 3- Find the end-user you want to go to. 5- A new sub-heading bar will be available, and click on Emergency Inbox. For testing the Emergency Inbox, you can deadhead the SMTP delivery address by changing the delivery server to 1.2.3.4 This should start spooling and deferring the messages putting them in the Emergency Inbox. Click on the Pencil Icon to the domain your looking to change. When your done testing just reverse the changes made. Note that Strategic Partners and Channel Administrators cannot access other customer's Emergency inbox's but their own. When attempting to launch an Emergency inbox that you do not have permission to view - a blank window will be displayed. The Emergency Inbox feature is available by default to all registered accounts with at least end-user privileges to access the interface. There is a predetermined number of days that this Emergency Inbox is available. This is termed as Instant Replay in the features. 1- https://moduscloud.cloud-protect.net - North American Clients. 2- https://moduscloudeu.cloud-protect.net - Euro\AsiaPac Clients. Emergency Inbox feature is available for all registered end users across all three packages. However, the availability of this feature is available for maximum 30 days. 4- Click the end-user's name/email address or the Edit link on that line. 5- A new sub-heading bar will be available, and you may now click on the Emergency Inbox. The following steps should be taken to route email outbound from Office 365 to modsuCloud. These steps will help you provision/setup outbound mail-flow. Follow these steps to enable relaying on modusCloud. 3- Enable Outbound Relaying and click Save. 4- Click on the Domains tab. 5- Click on the button Manage Hosted Services. 6- Click on the slider of Office 365 and click Save. NOTE: When this is enabled modusCloud will automatically manage the IP ranges for Office 365 published by Microsoft. Updates are performed daily. Follow these steps to route outbound from Office 365 to modusCloud. 1- Log into the Office 365 Admin Center. 2- Select the Admin Center > Exchange menu item. The Exchange Admin Center is displayed. 3- Select the Mail Flow > Connectors menu item. - Create a new connector by clicking the + icon at the top and set a New Connector as follows. From: Select Office 365 from the drop down list. To: Select Partner Organization from the drop down list. 4- Click the Next button and complete the following below. Name: Enter a name for your connector. Turn On: Select this option to enable connector. 5- Click the Next button. 6- Select the Only when email messages are sent to these domains option. - Click the plus icon + to add domains that should use this connector. - Enter a value of * (asterisk), this will route all outbound emails through moduscloud. - Click the OK button and click the Next button. 7- Select the Route email through these smart hosts option. - Click the plus icon + to add your modusCloud smart host. - Click the Next button. 8- Select the following options. - Always use Transport Layer Security (TLS) to secure the connection (recommended) Issued by a trusted certificate authority. - Click the Next button twice to verify settings and continue. 9- Add and email address of a recipient for a domain external to your organisation and click Validate button. NOTE: If you did not choose to turn the connector on Step 4, validation will fail. if your validation results show that the connection was successful, but the email failedd to send because the domain of the recipient is not configured as part of connector - this may be due to connector being disable. Try enabling the connector and re-attempt the validation. 10- Once Office 365 has been successfully validated click Save to complete the configuration. 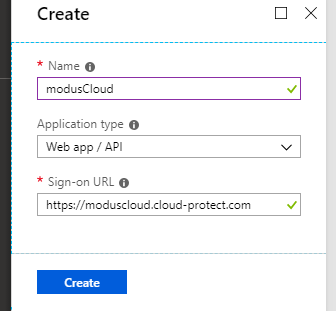 The following steps should be taken if one would like to setup modusCloud with Azure AD and synchronize the user accounts according to license, active users, or disabled account. It also provides the option for Office 365 central authentication. Follow these steps to create an Azure application which will be used as part of the synchronization. 1- Login to your Microsoft Azure portal as an administrator user through https://aad.portal.azure.com. 2- Click on Azure Active Directory on the left side panel and click on App Registration. 3- Click on + New Application Registration on the page. 4- In the fields displayed, enter a name for the name (i.e. modusCloud). 5- Select Web app / API for the Application Type. 6- Enter the appropriate modusCloud interface URL for the Sign-On URL (https://moduscloud.cloud-protect.net). 7- Click the Create button to view created under App Registration view. 8- Copy the Application ID displayed in notepad and click the Settings tab. 9- Click on Required Permissions Then click on Windows Azure Active Directory. 10- Ensure that the following permissions have been applied and click Save. 11- Important make sure to click Grant Permissions under Required Permissions. 12- Next click on under Settings the option Keys and enter a description and set to Never Expires and click Save. 13- Copy the Value key entry that is displayed into notepad. 14- You may now close and log off Microsoft Azure. 1- Login to modusCloud interface either US or EU. 2- When logged in select Company Settings then Import Users then Azure Active Directory. 3- Enter the primary mail enabled domain name followed by the Application ID and the Key from steps 8 and 13. 4- Check which accounts you wish to sync and how to sync and change the Sync Frequency to 1 hour and click the Save button below. 5- A message will display stating Settings Saved then scroll down to the bottom and click the Search Now button. 6- At this point a report will display on which accounts or object you would like to add or remove from the Azure synchronization. 7- Once you are satisfied with your selection click Sync Active Directory. 8- A final notification is displayed to confirm your request simply click Confirm this may take a few minutes to update. 9- When done you can now click on the tab Users & Groups and all your Azure users, distribution groups, security groups would all have been imported. When configuring a new domain it is important to note that one must verify a domain with the recommended text record followed by enabling the domain so that the domain is able to send or receive emails. 2- Locate the company in question you would like to verify. 3- Click Company Settings then Domains tab then select the Edit pencil icon. 4- Once in the Domains tab ensure that the Domain Purpose is set to Relay and the proper Delivery Destination is defined. 5- Click on the Verification Method drop down list and select Verify by TXT record and copy the TXT record provided and click button Verify Later below. 6- Add the TXT record in your DNS space for the domain you wish to verify and enable. 7- Once added to your DNS, go back to modusCloud Company Settings then Domains tab then select the Edit pencil icon. 8- Click the Verify Now button below and a message will display that the domain has been verified. 9- Click the button that reads Domain List which will return you to the Domains tab. 10- You can now enable the domain by simply switch the toggle from OFF to ON. IMPORTANT: Once the domain has been verified and enabled, you MUST wait 30 minutes before the domain is available for routing inbound and outbound. Delivery summary: Any time you see, "This message was rejected by its destination for reasons outside the control of modusCloud, and got returned to the sender", this literally means that this is outside our control, and this issue must be with the Customer/Recipient server accepting the message. 452 4.3.1 Insufficient system resources: This normally means that the recipient/customers server doesn’t have enough resources to accept messages. Customer/recipient needs to resolve this issue before we can deliver the message. (MS Exchange). 550 5.1.0 sender rejected: The senders IP address is rejected due to a Blacklist/ wrong SPF. This is outside the control of modusCloud. 550 5.7.1 Relay Access Denied: We are a closed relay system. This means if a user is in the modusCloud system we will deny access to any e-mail that is not registered. With our latest modusCloud release (5.60) users are able to login to their account via Office 365 integration. To login with your Office 365 account you must have already imported users into modusCloud via Azure Active Directory.. 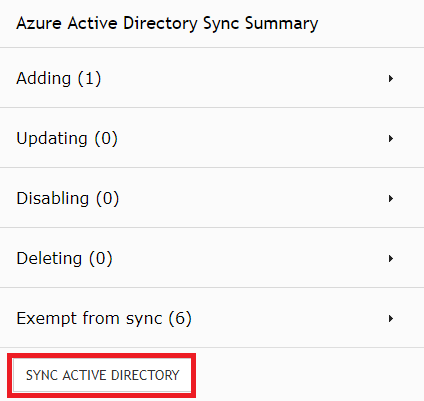 If this has not been done, you will have to perform the AZURE ACTIVE DIRECTORY SYNC. please contact Vircom support so that our support team may assist you. 1- Go to your modusCloud account login page. 2- Click on Office 365 Account button. 3- The option will redirect you to Microsofts account login. 5- If successful the login will redirect back to modusCloud and you will be automatically signed into your account. If unsuccessful an error will be generated, error: Azure authentication failed. Please try again. Aside from importing user accounts, no further configuration changes are required. Another way to provision users to the modusCloud service is with SMTP Discovery. When enabled, SMTP Discovery allows email to be relayed to non-licensed users. Users become licensed-users when manually added within the span of 30 days, a specified number of valid messages are received for that unique address or one valid message has been send outbound from your local mail server via the modusCloud platform. An administrator can change the SMTP Discovery settings. Users will only be automatically added for received messages if "EXPIRED ADDRESSES DEFAULT TO NEW USERS" is enabled, and only added automatically for outbound if "AUTO-ADD NEW USERS DETECTED VIA OUTBOUND" is enabled (both options listed under the SMTP Discovery setting). If these options are not used, they will need to be added via the "DISCOVERED LIST" within the NEW USER report, or via the SMTP Discovery report under USERS & GROUPS - SMTP DISCOVERY. 1- Click on the tabs COMPANY SETTINGS - FEATURES. 2- Disable (uncheck) or Enable (check) the SMTP Discovery checkbox and click SAVE. 2- Choose the default privileges type for new users. End User: This user privilege type will receive a quarantine report and can login to the modusCloud user interface. Silent User: This user privilege type will receive a quarantine report and cannot login to the modusCloud user interface. 3- Select Inbound Detection Threshold. The number of clean emails in a 1 month period before the address appears in the SMTP Discovery list. 4- Choose how many times you would like to be notified about an address before it expires. The named technical contact will receive a weekly notification of discovered addresses. This selection determines the number of notifications, which will be delivered before an address expires. ModusCloud will not deliver email to an expired address. 5- Disable (uncheck) or enable (check) if expired addresses default to new users. 6- Disable (uncheck) or enable (check) if aliases should be automatically associated with accounts. 7- Disable (uncheck) or enable (check) if users detected via outbound should become licensed. 8- Disable (uncheck) or enable (check) to send out a report on new users. 9- Disable (uncheck) or enable (check) to send out a report on new aliases. 10- Disable (uncheck) or enable (check) to include the administrator contact in the report. 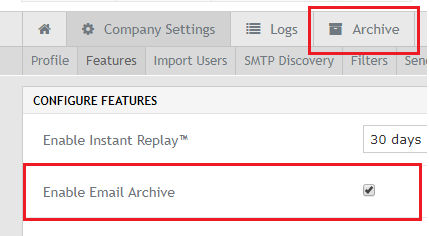 2- Click on the SMTP DISCOVERY tab. 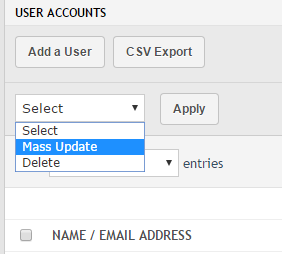 3- Use the pull down to select "DISCOVERED LIST" for discovered accounts, or "MARKED INVALID" for accounts that have been marked invalid (and can no longer receive emails). 4- Click the checkbox next to any accounts you would like to have added as users. 5- Change the pull down next to the APPLY button to "CREATE USER ACCOUNT" (to add as a normal user), "CREATE FUNCTION ACCOUNT" (to add as a functional account), or "MARK AS INVALID" (to move them to the Marked Invalid List. This will prevent them from receiving any emails). 6- Click the APPLY button. Please view the article SMTP DISCOVERY MANAGEMENT for more information on managing SMTP Discovery users. Spam settings can be adjusted from the Spam option tab when logged into your interface. 1- Sender Domain MX Records. - No DNS, A record, or MX record. - A malformed MX record such as a record with a zero-length MX hostname. 2- Sender Domain MX records that point to private / reserved IP ranges. 1.27. Locking Down Office 365 for modusCloud use. with the introduction of modusCloud it is common practice that new security procedures will be required. This is true if the adoption of modusCloud with Azure Office 365. One must be prepared to tighten or lock down Office 365 to only accept or receive emails from our cloud solution. Add a mail flow rule to all email to be sent from modusCloud. 1- While in Azure access the Exchange Admin Center. 2- Click mail flow then rules and click + icon to access the pull down menu. 4- In the new rule window, compete the required fields. - Enter a value for Name description. - For "Apply this rule if ..." select "The Sender is located..." and "Outside the organization". - For "Do the following..." select "Reject the Message with the Explanation..." Then enter text "Unauthorized IP" and click OK.
- Uncheck audit this rule with severity level. - For "Choose a mode for this rule" select "Enforce". - Select "The sender IP address is in any of these ranges or exactly matches". - Add the IP address from the Getting Started with modusCloud IP range in the IP address list. 7- Uncheck the checkbox to disable the rule. you will re-enable the rule once you are ready to cutover mailflow.